Disney/PIXAR’s Finding Nemo is one of Zoe’s favorite movies. We have watched it over and over together, and I’m pretty confident I could quote nearly the entire thing while watching it. After it’s over and a certain band of fish escape the tank, I’ve always wanted to know: what’s next??? 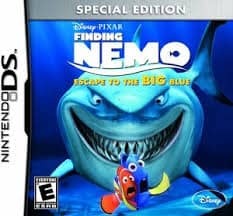 For the release of Finding Nemo 3D, the Nintendo DS game for Finding Nemo was released in a new special edition. I’d never played the previous version, so I don’t know what may have changed from one edition to another. The name of the game is Finding Nemo: Escape to the BIG Blue, and it’s rated E for everyone, so even children as young as my daughter, who is five, might enjoy playing it. She’s only just started to get interested in video games, and is fairly adept at playing game apps on the iPhone and the iPad. The Nintendo DS offered some new challenges for her, and she wasn’t quite able to maneuver the stylist around and divide her attention between two different screens. Finding Nemo: Escape to the BIG Blue is comprised of mini games and clips from the feature film. Players help each of the fish from the dentist’s tank escape into the ocean, crossing streets filled with fast moving traffic and avoiding hungry seagulls and crabs. The mini games are a bit repetitive; each game to save the fish is virtually identical and begins with the same scene from the end credits of Finding Nemo. Younger players will love the repetition, but older players who want to skip through the film clip and move straight on to the game will be able to. Another fun feature of this game is the ability to earn points so players can “purchase” items (including Finding Nemo characters!) to decorate both the reef and the tank. All of the earning is done inside of the game, and players will not need to use real money to buy these objects. Parents are sure to appreciate this aspect of the game, since there are so many apps out there that might require real money to get ahead in the game. Finding Nemo: Escape to the BIG Blue offers hours of entertainment for adults and children alike. The graphics of the game are stunning; they may not be movie theatre or home entertainment quality exactly, but you will feel as if you are right in the film with your favorite Finding Nemo characters. I can’t wait to watch this with my son, I watched the first one when I was younger and babysitting and the kids and I loved it. The actors in it make it that much better and funnier. Looking forward to this movie!! My great-niece, who is 4 years old would absolutely love this. I have seen the Nemo films and just love them myself. It will be something to make great memories! The game looks like fun for everyone! thanks! My little granddaughter loves Nemo and Doris and is always asking to see the movie again. She would love this film and playing the game. We love this movie and I am sure my kids would love the game! The older my son gets the harder it is to find games that hold his attention. Everything is either too easy or too hard.